This developer is really making sgp users proud. 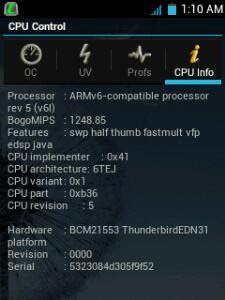 He was the the one who introduced swap support for our galaxy pocket, and now it is overclocking support via his kernel. Overclocking is a nice feature and very important to low end devices because it helps to increase the processor speed/clock of the device to a higher one,which mean better performance and speed when running applications on the devices. * Fix backup and restore vMOO CWM. * Now you will need an application CPU control which you will use to determine or set the frequency to whatever you want. 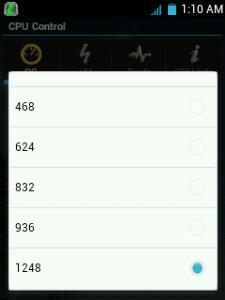 * Just open this app and select the frequency you want. Here are some screenshots from my galaxy pocket. Overclocking will require more of your battery power,so be ready for that. Now we only need CyanogenMod! i download many games...n wen i try to install dem.......... ..
den it shows "application not installed"
First wipe cacge in cwm then try again ti install games,if it contiues with application not installed it mean the game or app cannot be installed on your device. 3.remain until around 20-30 secs. if it doesn't work just retry the steps. Best kernel ever !!! Drains a lot of battery though and overheats mobile . 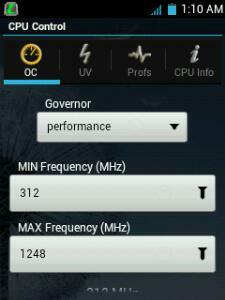 My phone lags a little sometimes with 1.2ghz OC . Does this kernel support swap? Bcos am using d former version with swapper on my g pocket. And I intend flashing this. It this working on galaxy pocket duos also. can u post for the best setting for the cpu control. best performance and best saving battery. Well dat depends on what you want,try diffrent gorvnors to see the one that suits you. The kernel download link is not working OOº°˚˚˚˚°! Admin pls do something. oh yeah, why the link is not work? Another crap fucked up my mobile again, now got to install a new stock rom, can;t even go into normal recovery mode,doesn't speed up the phone, the opposite and crashes always. it supported swapping and overclocking on my fon but the problem is that the STATUS BAR went missing.. any help admin? i am using Droid Belt custom rom on my device. reply ASAP tnx. You must install CWM (clockworkmod) for galaxy pocket first, and than you can install this kernel from CWM. The rebbot option in the recovary mode always get stuck at the Gt-5300 logo. I think that is one of the problem in the kernel. Looking forward for Final release version. Hope this Kernel improves more..
my mobile stucks on black screan after the animation ....wht shoul i do???? its not even opening? plz help...!!!!plz.plz.plz. i want my original stock kernel back what shall i do ? @Anonymous... I just want to believe u did not see the link to xda on my post because its there lool below. Admin How must I flash it to avoid soft brick. And will it speed ma phone. Just place it in the root of your sd and flash in cwm. Admin does this work on stock rom and will it really speed up hd games too like gta will it really speed up ma phone. I've flash every kernel but I got up on bootloop all the kernels if I may ask. Is there a thing I must do before flashing this kernel ect flash custom first on custom rom. I'm on stock rom xxfl 4 will this kernel work and speed things and I don't need any bootloop last time I've flashed a custom rom then it bootlooped I had to recover it using odin all hd games apps were removed then again now I don't need to be on a bootloop I want a safe procedure everytime I flash I read the instruction above and then flash on cwm. f*ck this. . KerneL. . It always hang my phone! I choose to have infuZion than this one. ! But anyways thanks. . Hope riskey develop it more functiönable. .sorry for my english! it will make your phone laggy if you make a wrong setting. works perfect on my phone. or google for governor and scheduler for your reference. how can i remove this from my phone??? Overclocking works just fine...Only problem I have, is that my Bluetooth doesn't work any more..Any suggestions? thank for info..but,it is possible to go back to previous state?im meant stock firmware..
i try too flashing with odin , but not working HELP!